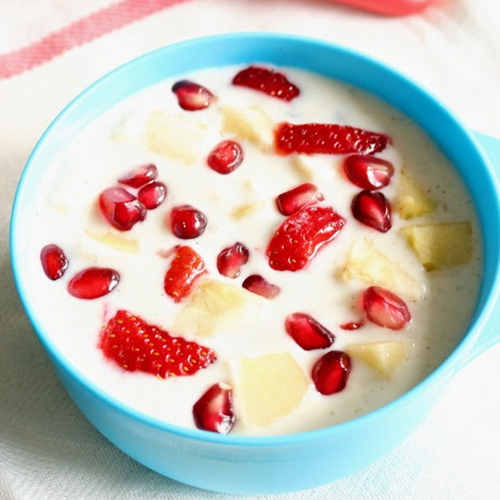 Fruit Raita is a healthy and yummy. A simple and easy raita recipe to go with your regular meals or the food you prepare for fasting or vrat. 1 1/2 cups low-fat curds (dahi) beaten, 1/2 cup low-fat milk, 1/2 cup chopped mint leaves (phudina), 1/4 tsp finely ground pepper, salt to taste, 1 1/4 cups chopped apple,1 tsp lemon juice,1 1/4 cups chopped pineapple, 1/2 cup pomegranate (anar), 4 Almonds. Whisk the curd with hand mixer (Mathni) properly and mix salt, sugar, ground pepper and curd is thick add little milk or water. Combine the apple and lemon juice in a bowl and toss well. Add the pineapple and pomegranate, mint leaves, toss well and refrigerate to chill. Refrigerate the dressing for at least an hour. Just before serving, add the dressing and toss well. Serve chilled.